7 dec 14 edit Motorola have uploaded twelve videos in the last week centred around the Moto 360 and the X. What started out as one short post (when I spotted a high audience retention %) has now turned into a nice little study. 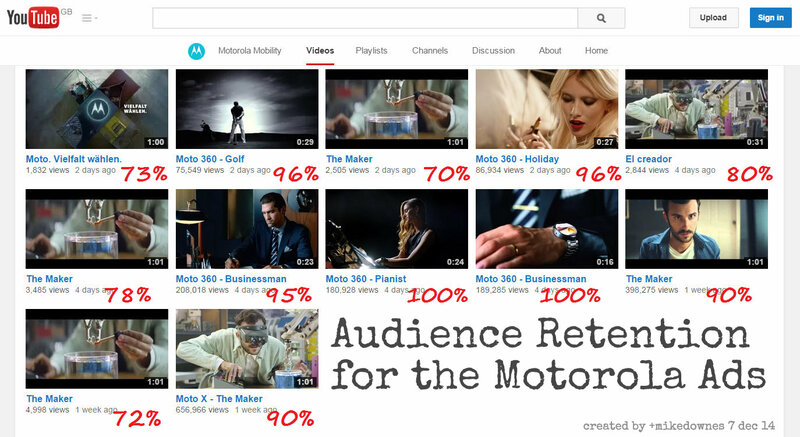 From the dozen videos we have some fantastic retention numbers. There are 1.8 million views so far - that's no real interest to me. Although, I'm sure it will be to Adrienne Hayes (Motorola's SVP, Marketing and Communications) or their agency who seem to have thrown over 50 staffers at a recent Motorola campaign. 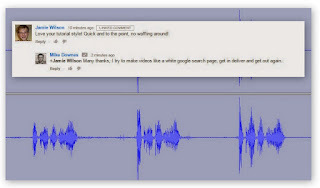 The takeaway - short videos less than a minute do very well, they retain an audience. Maybe, if you had just one person, making a video in their spare room (like +Marques Brownlee) you would commision the thing to be 41 seconds long. After all, Marques has already had a live Hangout with Dennis Woodside, CEO of Motorola (6 dec 13). To push the point, we all have free tools like Youtube, we all have a camera phone and can learn how to post edit a video. 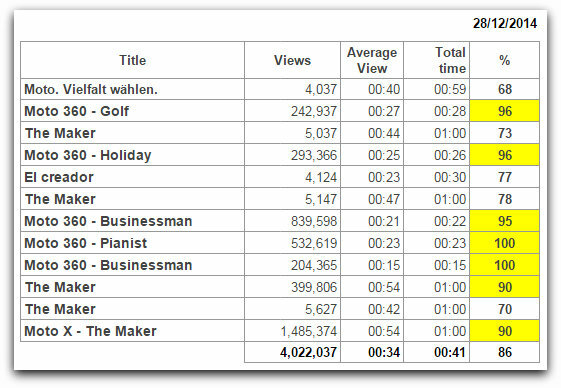 All we really need is..
28 Dec 14 edit | the table below shows the jump from 1.8m views to 4 million (from 3 dec 14) yet still retaining average audience retention of 34 secs (86%) .. Since 3 Dec, the Motorola channel has uploaded 13 more videos. 3 dec 14 edit | From the 428,397 views, it's had an audience retention of 92%. The video is an idea 60 seconds long. Let's break that 92% down while understanding why people have watched till the very end. Looking at the elements of the 43 clips, we have a figurative tennis match where the viewer follows the rapidly moving ball across the net between Designer and Maker. This continues, with an average clip length if 1.398 secs. Where the last two slides are a balance. I choose the tennis analogy as we humans will following a fast moving object, usually until we are told not not. Remember, there are no words in this clip, just music, action and some comedy. It's a lot about good timing ie the colour change to bamboo. /edit Watch out for the 0.06 alarm, 0.21 conflict, 0.30 tension, 0.35 more tension leading to the 0.52 resolution and pay off - all very cool story telling. Had there been a spoken script, it would've slowed down the flow and pace while probably extending the clip to maybe two and a half minutes - and if you do that, big risk you'll end up losing most of your audience. All of you are capable of looking deeply at the slide and decide for yourself. What have I missed? /as always my door is open for discussion..
Edit 5 Dec 14 at 3.45pm Views and retention are as follows..